p(blue). Editor's note: Catherine Bennett Dunster wrote the Health+Food column from June 2007 to April 2008. Yours is an excellent question, but as with most things related to nutrition, the answer is not a simple one. In fact, hold on to your hat — this takes a little explaining. Amid cries that Americans eat too much fat, we are indeed being told to increase certain types of fats in our diet. Nutrition researchers and practitioners making these recommendations are referring to polyunsaturated fatty acids (PUFAs) — more specifically, omega-3 fatty acids. While saturated fats and trans fats continue to be regarded with disdain and are considered downright hazardous to health in most circles, PUFAs are actually thought to play a positive role, most notably for heart health. The trick lies in getting to know your omegas and then keeping them straight once you do. One of the omega-3s, alpha-linolenic acid (ALA), deserves special attention. Our bodies cannot synthesize it, but need it to function properly. Consequently, it is essential that we consume it in our diet; hence we call it an essential fatty acid. ALA can be found in many plant food sources, including flaxseeds, walnuts, pumpkin seeds, and tofu; it's also found in vegetable oils, including soybean, rapeseed (canola), and flaxseed oil. 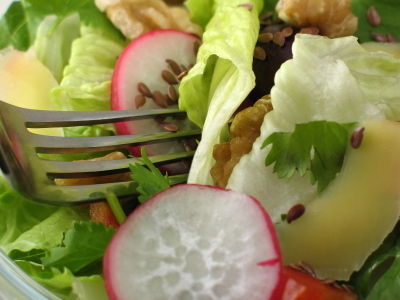 To get more ALA, dress salads with canola-based dressings and top them with pumpkin seeds, flaxseeds, or walnuts. Use ALA-rich oils for baking, sautéing, and stir-frying; sprinkle walnuts, flaxseeds, or pumpkin seeds over a bowl of yogurt or hot or cold cereal. We really can’t talk about omega-3s without mentioning the omega-6 fatty acids, also PUFAs. Like omega-3s, omega-6s play an important role in health and are found in a variety of foods commonly used in the kitchen or added by food manufacturers to a plethora of products. Rich in omega-6s are oils from corn, safflower, soybean, sunflower, and sesame, plus sunflower seeds, pine nuts, and pecans. Scientists believe the typical Western diet has an excess of omega-6s, especially in ratio to omega-3s. This lopsided ratio may be responsible for much of the chronic inflammatory diseases seen today. Early humans ate a ratio of 1:1 omega-6s to omega-3s; current estimates push a ratio of 10:1 (and up!) by those consuming a Western diet. The cause? Less fish intake and excessive consumption of omega-6-rich oils. While some experts focus educational efforts on returning the omega ratio to its former dietary balance, many more recommend that consumers simply increase their overall intake of omega-3 fatty acids. The Linus Pauling Institute provides a list of food sources that contain ALA, along with an exhaustive amount of other omega-3 information. Two other omega-3 fatty acids are important components of our diet: docosapentaenoic acid (DHA) and eicosapentaenoic acid (EPA). The human body can synthesize DHA and EPA from essential ALA, but this synthesis is thought to be modest and insufficient at times. Fortunately, DHA and EPA can also be found in foods, primarily marine sources such as fatty fish (salmon, sardines, trout, and tuna). Additionally, DHA is found in algal oil, a component of algae (a favorite omega-3 source for vegans). The bottom line is that PUFAs — and therefore omega-3s — are critical for normal growth and development and play a crucial role in the body’s response to inflammation, infection, and injury. We can’t live without them. Over the past few years, research results have been pointing to other reasons for us to dish up omega-3s, most notably for their cardio-protective qualities. There is plenty of convincing research in reputable journals, but one recent study was particularly compelling. It looked at 13 studies and concluded that those who ate fish five times a week or more — compared to those who ate no fish at all — had a 40 percent lower risk of dying from heart disease. Omega-3s are believed to raise HDL levels (the good cholesterol), lower triglyceride levels (a blood lipid generally screened as part of a full lipid panel), and thin the blood. To date, the best research points to the helpful effects of DHA and EPA rather than to ALA — largely because the research has yet to be amassed using ALA. Until more research is done, we can’t say whether it is as beneficial as the other two omega-3s in this area. Additionally, it is worth noting that according to last month’s Nutrition Action Healthletter (published by the Center for Science in the Public Interest), a few studies have found that men who eat an average of 1,500 milligrams per day of ALA have twice the risk of advanced prostate cancer compared to men who average 700 milligrams per day of ALA intake. The CSPI recommendations? Until more research is done, men would be wise not to raise or lower their ALA intake. Researchers continue to look at omega-3s and a variety of other health concerns. Studies run the gamut, from prevention of macular degeneration (likely because DHA is a structural component of the retina) to Alzheimer’s disease and certain cancers. So far the results are promising, but scant. So far, there’s decent evidence that DHA and EPA — the omega-3 fats in fish oil — can reduce your risk of a heart attack, but the results are premature on whether or not omega-3 fats in fish lower your risk of cancer, memory loss, or macular degeneration. Eat fatty fish, such as salmon, twice a week. (I suggest you alternate canned salmon and tuna for sandwich variety, and incorporate mackerel, trout, and sardines into your monthly meal plan.) That would supply 500 to 1,000 milligrams a day of DHA plus EPA. If you’re a vegetarian, look for foods or supplements with DHA from algal oil. If you have heart disease, follow the American Heart Association’s advice to take 1,000 milligrams a day of DHA plus EPA from fish oil. If you have side effects like burping, try taking the capsules at bedtime or ask your doctor for a prescription for pure fish oil. Taking more than 3,000 milligrams a day of DHA plus EPA may cause bleeding. With all the buzz about omega-3 fats, newly created omega-3-enriched products are hitting the supermarket shelves. As always, inform yourself by reading food labels. If a food item boasts omega-3s on the label, read the fine print to find out which omega-3 fatty acid is being touted, then decide if it’s worth your extra grocery dollar. Remember: Despite frequent claims to the contrary, ALA has not been proven to prevent much — but the evidence is clearly there for EPA and DHA, at least in regard to heart disease. p(bio). Catherine Bennett Dunster is a registered dietitian and a former instructor at Oregon Health and Science University. She lives with her husband and two children in Portland, Oregon.